A good expansion for a great RPG game. Dark Arisen didn’t offer much in terms of story, A mysterious woman named Olra tells you about a place called Bitterblack Isle, A place where many arisens before you have gone to but never came back, after going there Olra tells you that she doesn’t know much about the Isle but she does remember quite a few things about the place, It’s up to you as the arisen to either enter the Labyrinth or head back to Cassardis and be on your merry way. Without knowing where the Isle came from, nor knowing what it has, what’s the history of this Isle, the game doesn’t really tell you anything about it, not even a single book that gives us at least a backstory of this place. so don’t play the expansion if you’re expecting a good story or any story at all because there really isn’t one. Having new equipments, Items, Quests & Magics gives a new experience to any Dragon’s Dogma Veteran, As your arm yourselves with these new Equipments, be also ready to fight stronger monsters and monster that you have never encountered before, Bitterblack Isle gives a Demon/Dark Souls feel to the game & it essentially turns to a Dungeon Crawler game which I really don’t mind playing considering the fact that I love dungeon crawlers, due to some gamers complaining that the original Dragon’s dogma game was not so hard, Capcom spiced up the game with a new difficulty level & Bosses that you have not encountered before..what’s that? you want an example? sure..how about this. 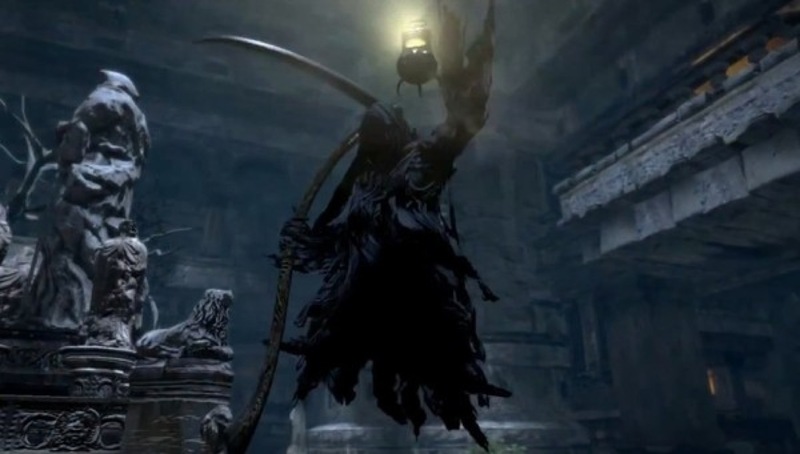 prove your strength fighting him, even the most strongest of warriors have fallen to his scythe, if you still think that he wasn’t challenging enough then there’s an extra feature added just for you by Capcom..Hard Mode, Play Hard mode and enjoy the wonderful yet punishing experience. For a console game I’d say Capcom did a pretty good job with the graphics, outside the Labyrinth In the fields of Gransys the sun shines bright on everyone walking the earth during the day with wonderful sounds of mother natura (that’s not a typo, I just like it that way), you can hear the sea, Look at the trees do whatever it is they do, friendlies travelling from town to town all is good & peaceful until the night falls and the wolves leave their dens..Unlike most games the darkness in here is what I really call darkness, so light up your lantern and fight through it, unless you would rather travel through a dark field where you can barely see a thing, that’s for the outside world of Gransys, let’s head back to the Labyrinth now, within the expansion you don’t get to experience much of what Mother Natura has to offer (see I did it again, Natura <3), as you lurk the dark halls & explore the shadowy corners the visuals are good enough to make you feel like you’re actually in that particular place with the help of the sounds of monsters & spiders or probably the footsteps of your fellow party members as you travels those dark halls into oblivion, one thing I really love about Dragon’s Dogma in general is the dialogue, for example when you’re fighting a certain enemy, you can hear your pawns talking to you, advising you to attack at a particular moment or cling to an enemy or probably cut off its’ tail.